There is a simple rule for both cases, all the blanks can be filled and the sequence can be continued ad infinitum. 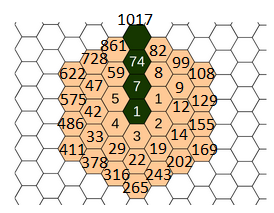 you fill out the honeycomb by simply adding the sum of the surrounding cells into the next cell clockwise. It would be interesting to see in another solution what is the mathematics behind this rule. I suspect nice recursions lurking behind the scenes.